this stomach bug is really getting the best of me. i woke up feeling absolutely horrible, so i'm home from work today with doctor leko. 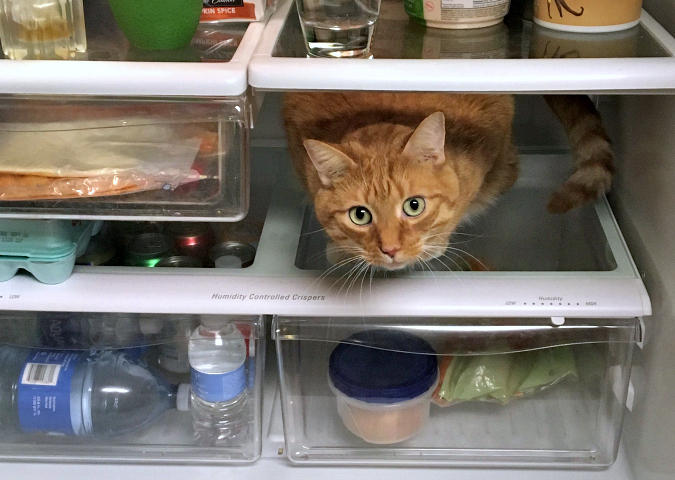 today i give you a picture of this cool cat who likes to hang out in our refrigerator. Not a good idea, Leko, so Mom doesn't forget to take you out. Sorry to hear that the bug is hanging on. Did you try warm coke or ginger ale? Eat bland foods until you stomach heals. What can we do? Can I take a day off and play nurse with Doctor Leko? I sure hope you start to feel better soon! That is just miserable.